Join the Ocean Blue Rewards Club! Introducing Fin Fun’s Ocean Blue Rewards Program! You love mermaids as much as we do, so why not get rewarded for it? Join our exclusive Ocean Blue mermaid club today for a tide of benefits that will enhance your shopping experience at Fin Fun. You’ll get full access to our members-only sales, receive information on exclusive sales, and be the first to order new products—just for signing up. And with every purchase, you’ll accrue points that turn into rewards! For every 150 points you accrue, you’ll receive a $10 reward to use on any purchase site-wide. In addition, you’ll gain exclusive access to a treasure trove of benefits, just for shopping at Fin Fun. The more you spend, the greater the rewards! In a nutshell (or seashell), it’s the first and best way to know about sales! As an Ocean Blue VIP member, you’ll also receive our mer-mazing monthly E-newsletter, the Tidal Times, which features mermaid sightings, fan spotlights, videos, and much more! We’re sure you will FLIP for this program created in honor of our dedicated mermaid fans! So, what are you waiting for? Signing up is so EASY!! 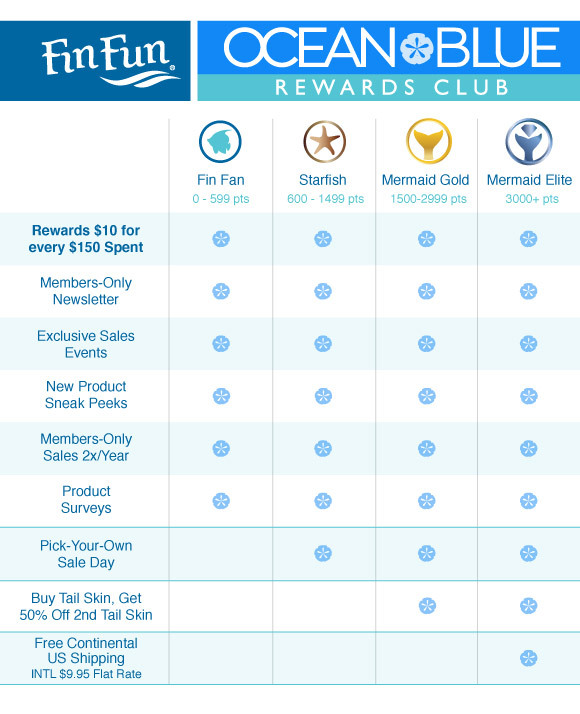 Here’s a quick chart that shows the various levels of membership, and the rewards you‘ll enjoy at each level. *Survey participation may require member’s consent to a non-disclosure agreement.